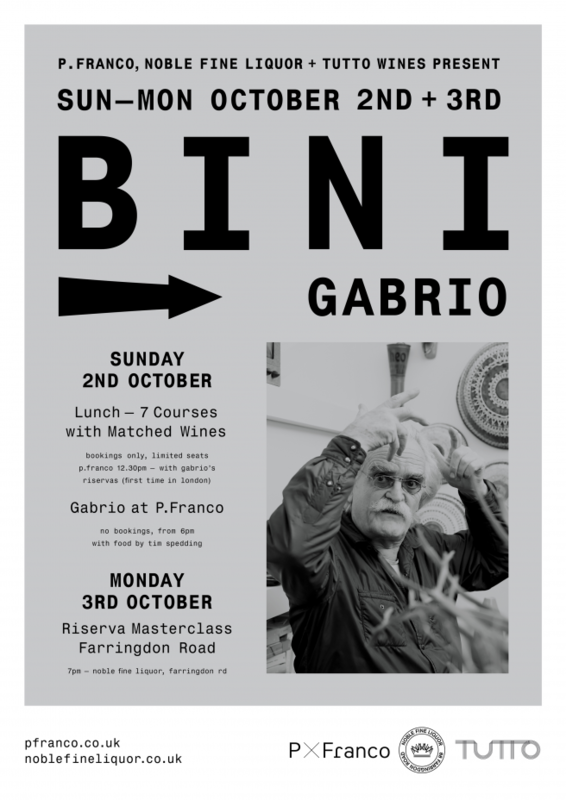 Gabrio Bini is perhaps our most known and loved producer. The wines he produces from the old vines and ancient terraces of his farm, Serragghia on the island of Pantelleria taste like no other. They are amongst the most pure, expressive and delicious we have tried. It is always a pleasure to have Gabrio in London, but this visit is really going to be something special as he will be sharing four new wines for the very first time. Named after members of his family, the four ‘riservas’ include a remarkable new Zibibbo from pie franco vines (‘Genevieve’), a Nerello Mascalese (‘Agung’), a Pinot Noir (‘Gabrio’) and Carignano (‘Giotto’) and Gabrio made just 300 bottles of each. To celebrate their arrival, we are hosting a series of very special events. These will be the only opportunity to taste the wines in London. We hope you can join us. We have never been as excited for an event as this. Next Sunday, join Gabrio at one of the dozen seats around the bar at P.Franco as he and P.Franco’s chef Tim Spedding host a lunch for the ages. Guests will enjoy seven wines from Gabrio and seven courses from Tim pairing the best of Britain’s larder with products from the Serragghia farm. Wines will include his Zibibbo and Fanino, the four riservas and a rare, nine year old Moscato direct from Gabrio’s cellar. For those that miss out on a seat at lunch, from 6pm the man himself will be behind the bar pouring a bunch of his wines by-the-glass. Tim will be cooking a few snacks using products from Gabrio’s farm and we expect it to be a hell of a good time. On the Monday, Gabrio will be hosting a masterclass at Noble Fine Liquor on Farringdon Road. This intimate tasting will provide guests with an opportunity to taste all four of his riservas side-by-side, with Gabrio on hand to share the story behind each of the wines and tales from the wild and wonderful island of Pantelleria. Gabrio will be pouring the following wines, presenting them at a tasting in the UK for the first and probably the last time.